The airport&apos;s parking is made easy and convenient for our customers whether you&apos;re flying out or dropping off loved ones. Parking is trouble-free and just steps away to the airlines. To help assist our customers, parking has covered walkways to protect you for inclement weather. 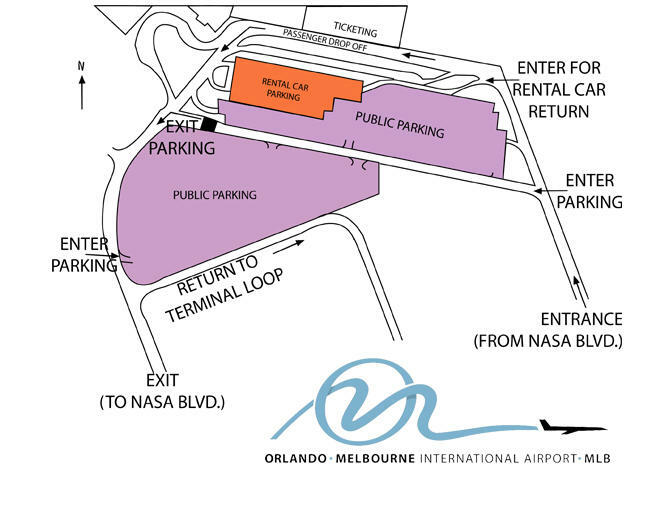 Our handicapped spaces are located close to the terminal and clearly marked. The parking lot is patrolled by video camera and the Melbourne Airport Police Department. There is no short-term or long-term parking; it&apos;s all one rate. The parking lot is unable to accommodate motorcycles and oversized vehicle parking. The airport offers a cell phone lot for customer that do not wish to park to pick-up passengers. The cell phone lot has easy access and is free of charge. It is located on the "Return to Terminal" road and is marked " Cell Phone Lot". Customers MUST stay with vehicle in this area.